Are you finding it difficult to manage your Biochem preparations?? Want to know what should be the correct approach to prepare Biochem in an easy & quick manner? i) How biochemistry could be done in an easy, quick, short & effective way? ii) I have recently subscribed to the Biochem App and I am following a pattern of seeing videos first and then writing notes. But it is very much time-consuming. Please suggest the correct approach! 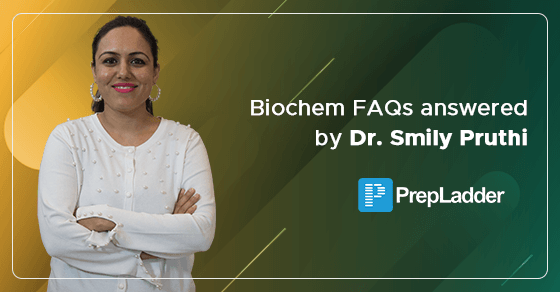 PrepLadder asked help from ace Biochemistry faculty Dr. Smily Pruthi to answer the Frequently Asked Questions by the students. Dr. Smily Pruthi MBBS, MD, is the Author of the best-selling book “Conceptual Review of Biochemistry/ CRO Biochemistry”. In her years of experience, she has helped thousands of UG, PG and FMGE aspirants. Watch all videos of the app in a sequence (my sequence is well planned). Use my book (written in the easy language) instead of making all notes. Make notes only of those topics, which seems very difficult for you. Otherwise, add notes in the book only. Writing notes is always time-consuming. The sequence of topics in book & APP is 90 % same. It can save your time & you can do this subject in 15-20 days, with 3-4 revisions. Just before the exam, you can then do revision in just 1 day. No need to do rare topics as they are not rank deciding. Only do conceptual & frequently asked things of biochemistry (don’t start doing Ph.D. of biochemistry). Do that much which is just sufficient for your exam. You can increase the speed of video lectures in APP for the second revision.